Please come and join us for a fun filled day. 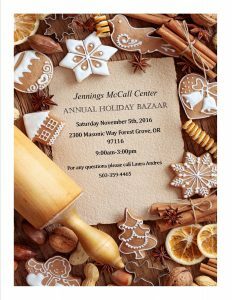 We will be having 70 tables of mostly handmade items available for the Public. 1-2 Midnite Oils– Hand Crafted Soaps, Perfume oils, Pain Relief Lotions, Body Butters, Sun Screens, Lip blames and much more. 3– Laddie Boy Designs– Stained Glass Gifts, Fused Glass Jewlery. 4-5– Ilene Frank– 3-D Pictures, Banana bread, Pillow Cases, Towels. 6-7– Pattie Rose– Hangers, Runners, Pies, and other handcrafted items. 9-10– Katie McBrunett– Scarves, Blankets, Décor Boxes, Jewelry, Pottery, Christmas Décor. 11– Tracey Sparks– Heating and Ice Packs, Fun Magnets, Ornaments, Jewelry, Gag Gifts. 14– TWAK Press– Watercolor and Pastel Sketches, Note cars, Books, Fusion glass, Table Cloths, Placemats and Napkins. 15– Mizphan #30– Crocheted scarves, Potholders, Lap rugs, Padded pet rugs and much more. 16-17– Scentsy– Scentsy products, Wax, Warmers, Puffers, Oils, Soaps and more. 18-19– Linda Randel– Quilts, Placemats, Aprons and cloth storybooks. 20– Tornincasa Soap Co.– Handmade skincare. 21-22– Rose Jackson– Rock Items, Rock jewelry, Polished stones, Sterling rings with stones and more. 23– Diana Martinez– Jams, Jellies, Crispy sweet pickles, Pickled Beets, Spaghetti sauce, and more. 24-25– Rough Cut Soap Co.– Soaps, Bath salts, Lip balms and more. 26– AKR Wood Toys– Wood toys, Cars, Trucks, Trains, Airplanes, Puzzles, Bird Houses and more. 28-29– Home Star Chapter #187– Baked goods and more. 30– Trinity Treasures– Handmade Repurposed Jewelry. 31-32– Connie Crossley– Vintage Linens, Children’s Clothing, Stuffed toys, Knit and Crochet items, Table runners, and more. 33-34– Creations by Kenaxy– Walker bags, Adult bibs, Card holders, Gloves and more. 35-36– Retired Teachers– Hand painted wooden items. Fall Items, welcome signs, and more. 37-38– Darlene Sehorn- Bags, Table runners, Knit Hats and more. 39– Beaver Chapter #106– Home Baked Cookies, Fudge and more. 40– Susan and Melody Martin– Quilted Items, Table Runners, Hot pad place mats, Knitted hats and more. 41– Jae’z Custom Crafts– Scarves, Headbands, Shampoo, Conditioner, Deodorant, Body wash and more. 42-43– Julia Kohler– Quilts, Pin Cushions, Crochet washcloths and soap, hats, and scarves. 44– Damsel in Defense– Pepper Spray, Stun Guns, Personal alarms, and more. 45-46– Honeypie Creations & Collectibles– Pillows, Dolls, Teddy’s, Holiday Vintage, Quilts, Glass wear, and more. 47– Forest Hills Nile Club. 48-49– Ellen Jackson– Fused Glass and Jewelry. 50-51– Creations by Joy– Scented candled, Gnome Homes, Fairy Houses, Holiday Décor and more. 52-53-Originals by Sheila– Crocheted adult and children’s sweaters, Hats, Pickle Jams, Jellies, Scarves and more. 54 –55– Deborah Thomas– Rugs, Quilts, Linens, Bibs and more. 56-57– Lularoe by K+K Fashion– Tops, Skirts, Dresses and leggings. 58-59– Toni Jones– Baby Blankets, Hats, Scarves, Fleece Blankets, Necklaces and more. 60– Colby Hanna Photography– Cards, Prints, Canvases, Calendars and Metal Prints. 61– Soap, Earth– Cold Process Soaps. 62-63– Donna Vandehey– Knitted Shawls, Aphgans, Hats, Dish rags, Sewn Adult Bibs, Aprons and more. 64-65– Irene Barnes– Crochet Afghans, Dish Cloths, Scrubbies, hats and more. 66-67-Secret Cupboard Creations– Sculptures, Jewelry and more. 68– Alan Liljenberg- Free Therapeutic Messages! 69– Gertrude Gibbs– Knit Pouches, Scarves and Books. Please come and join us for this wonderful event.